Window vinyl is an adhesive backed vinyl applied to a window. It is applied to either the first surface (outside) or second surface (inside) of office, clinic or storefront windows. These graphics range from custom computer-cut letters and logos to full color digital prints that cover an entire window. Once a design is ready for production, rolls of vinyl are loaded onto a plotter which cuts the letters or graphics to specification. Window vinyl comes in many varieties. Some of the most popular are computer cut, perforated, opaque and frosted. Computer cut vinyl is a value-priced option for window graphics. They are not as prominent as full size graphics, but can be equally effective when designed in accordance with your brand standards. Perforated vinyl has small holes strategically positioned throughout and is designed to allow one-way visibility. Passersby cannot see into your space, but your employees and guests can see out from the inside of your business. Opaque vinyl obscures visibility from both the inside and outside of the window. This solution is great for locations where privacy is important to your clients. Frosted vinyl is not completely clear or completely opaque. It allows light and shadow through the window and can provide privacy without blocking light. This is available for full windows or as cut vinyl graphics. 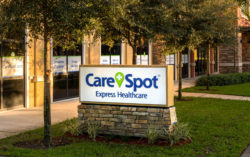 CareSpot, a Florida-based Urgent Care clinic, used opaque window vinyl to promote the available services they offered in their clinic, including on-site x-rays, online check-in, and more. This is a simple, yet effective, way to communicate with your existing and potential customers as they approach your business. MedPost, the sister brand of CareSpot, used perforated window vinyl for privacy in this Texas location. Shown on the right side of this photo, this solution allowed sunlight to filter inside, but prevented foot traffic from having a direct view of the waiting room. 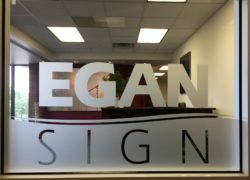 At our Egan Sign corporate office, we installed computer cut frosted window vinyl to the first surface of our front windows to identify our office space, while allowing full visibility into and out of our reception area. Window vinyl is a great way to showcase your business. Think these graphics are a good fit for your company or simply have questions about them? Don’t hesitate to contact us to start a conversation about window vinyl graphics or check out more signs in our Egan Sign Gallery.